Summer in London is nonexistent this year. My lack of Vitamin D combined with this incessant rain has left me down in the dumps. To cheer myself up, I decided to bring some sunshine to the kitchen. 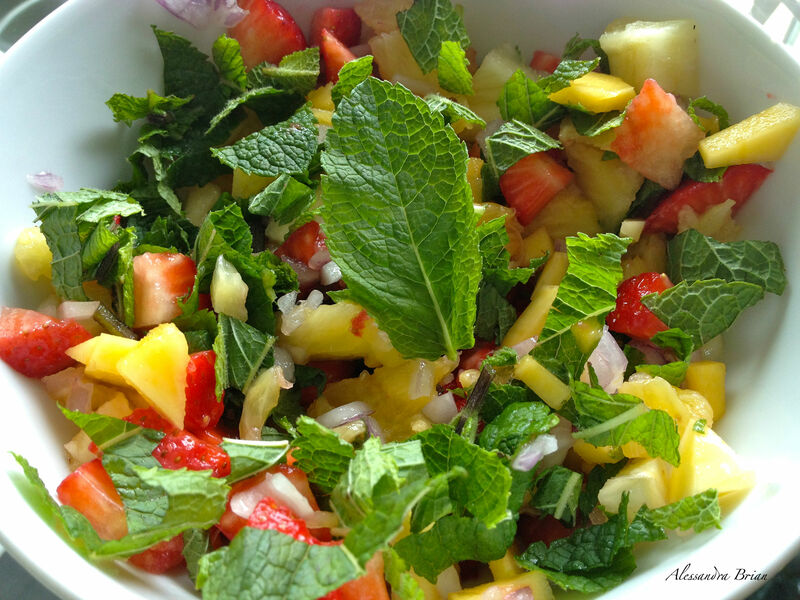 I improvised a bright, tropical recipe that will put a smile on your face that will shine through the gloomiest of weather. If you’re anywhere else in the world, experiencing a joyous summer of sun and water, this is the perfect, healthy summer lunch. Oh, and I’m jealous. Right, the ingredients. I am not the greatest at instructing how to cook a dish. Cooking is all very “in the moment” for me. I like to look at a recipe to get a general idea of what i’m making, and then go about adding a pinch of this and a dash of that. Feel free to take out or add anything you like. You are the chef, this is your meal, make it the way you’ll most enjoy it! Combine all ingredients thoroughly. If you’re missing something, be creative and add something else, or ignore it. Combine all ingredients and stir together. 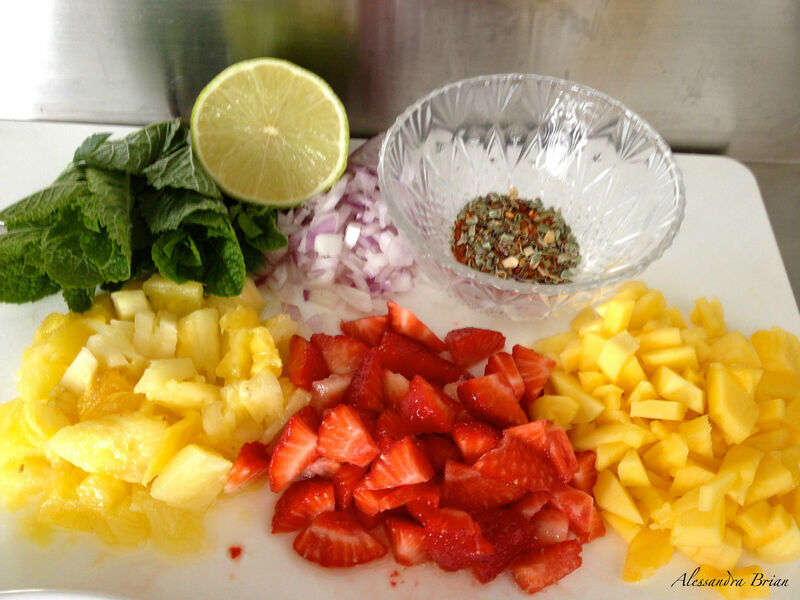 Cover with plastic wrap and allow salsa to macerate for 20 to 30 minutes before serving. 2. Drizzle Olive oil over salmon. 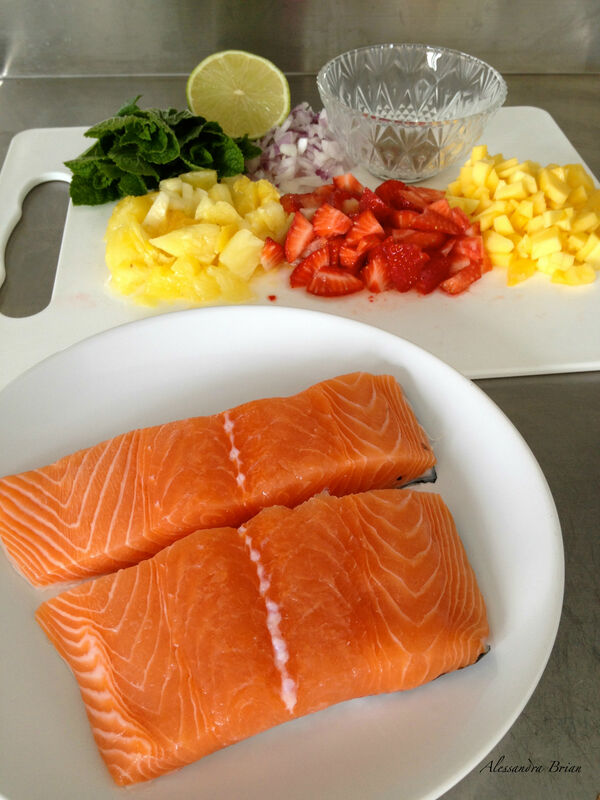 Cover salmon on both sides with seasoning. 3. Place fish on the grill, skin side down, and cook for about 3 minutes. Flip, and cook for an additional 3 minutes. Sear sides for an additional minute each, or until cooked through to the desired doneness. 4. 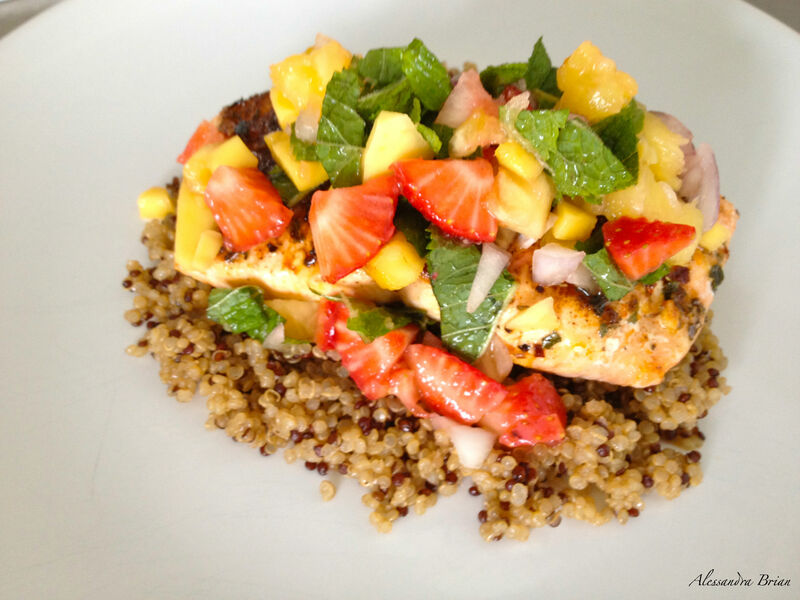 Plate fish and serve with fruit salsa spooned over the top. I had mine with quinoa, but you can have it with brown rice, noodles, or even on its own. I hope you enjoy your healthy summer lunch, and I really hope the sun comes out!